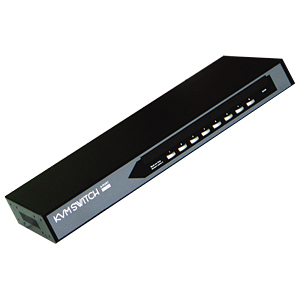 The UKV-088OSD is an 8-port cascadable 19'' Rackmount KVM Switch with OSD. This switch allows 8 different PC's to share one keyboard, monitor and mouse. It centralizes workstations and saves physical efforts without having to move between various server locations. The metal case makes it more durable and reliable than the plastic models. There is no interface card or software to configure. Installation is as easy as connecting cables between KVM Switch and your computers. Easy PC selection via On Screen Display Manual, Push Buttons, Hot Keys. It also comes with many advanced features such as OSD, Hot Key, Front Panel Push Button, Auto Scan Control, Hot plug, Password protection, and built-in Daisy Chain port for uplink to control up to 248 PCs!! The full-feature OSD gives an intuitive menu-driven operation most users will find dispensable for a truly convenient experience. Multiple units (UKV-048OSD / UKV-088OSD / UKV-0168OSD) could also be daisy-chained up to 16 levels and provide a total port capacity of up to two hundred forty eight PC's (depending on the unit combinations). The rackmount design offers a neat placement of the KVM Switch units on the rack for centralized management and also for security enhancement that could be provided by a locked server room. 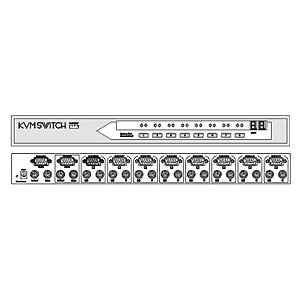 Hot Plug - Add PCs or Remove Connected PCs for Maintenance without Powering Down the KVM switch or PCs. Support for DOS, Windows 95/98/SE/ME/2000/XP, Linux, etc.